So we went on our second trip to the cinema two weeks ago to see the soon to be released sequel to Disney’s Planes. I haven’t watched the first Planes movie, but this wasn’t really an issue. 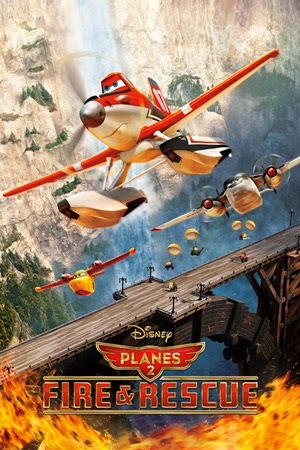 Planes 2 stood as a movie all by itself and I suppose for a child who hasn’t watched the first and can’t read, Roz couldn’t tell the difference either. The story is set in a world populated by plane and cars. the birds are planes, animals are planes and cars and the Planes are….planes. The main character, Dusty crop hopper gets into problems in the sky and is told by his mechanic that he won’t be able to fly past a certain speed, meaning he can’t be a racer anymore. Not wanting to believe this he decides to make one lone attempt at flying, crashes and sets his airfield on fire, damaging his gearbox in the process. The old fire engine is not fit for service so Dusty volunteers to train as the other fire rescue machine. He flies west and this is where the action begins. He meets new people including a grumpy trainer, a stalker/obsessive girl plane, a large quiet type helicopter plane and there is a lot of information packed in there and a lot of action. I must admit that if you’re intrigued by the world of firefighting, then this was probably a fantastic movie to watch. especially with children who are also into that world and are able for an hour plus movie with a lot of action. Roz is only three years and eight months so while she loved the movie and wanted to stay the whole length, most of it went over her head. The graphics were gripping and she loved all the car sequences and flying planes and, though most of the technical fire rescue language went well over her head, she was jumping up and down the seat with delight. Don’t worry, we were in the last row so thank fudge not blocking anyone’s view! I must admit that I found the idea of making the only female firefighter also stalker and obsessive a bit creepy as an adult, and as a woman, was more than a little annoyed that this is how they chose to portray her. The creators could have used the angle of a female firefighter to much more useful effect in my humble view to inspire young girls and not just boys, to not only be rescuers. Looking back, I should have gone with my nephew who’s nine as he would have probably enjoyed it a lot more for it’s information, but well…I didn’t did I? Roz enjoyed it, I found it pitched a bit too unbalanced for me to sit through, but can see how it would hit the spot for some people. Disclosure: I received free tickets to the premiere for the purposes of this review. However, all opinions are my own and I am not paid to give them. Next story World breastfeeding week 2014 : A picture is worth a thousand words.